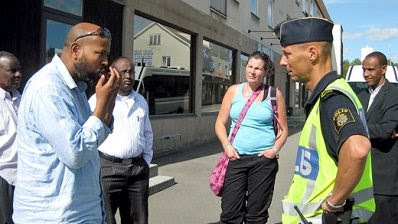 Our Swedish correspondent PMP has sent a report about two different aspects of the Somali community in Sweden. The first aspect involves the intimidation of Somalis by gangs of unspecified ethnicity. 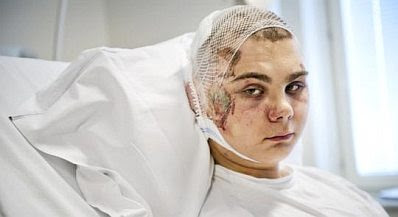 The second aspect features a story about a young “person of Swedish background” who was brutally beaten and burned by Somali “youths”. Below is PMP’s report, based on two articles in Avpixlat. The first concerns the Somalis in Forserum, and the second the attack on the white teenage boy. Let’s examine two recent news items in Sweden. Recently there has been a huge media focus on the persecution of Somalis in the small town of Forserum. Just today the headlines hit the front page on a major newspaper, Svenska Dagbladet. Yesterday, it was represented in a news highlight in the mainstream media. Stones had been thrown at the windows of the local Somali organisation. People had shouted ‘n*****r’ and other defamatory words. Somalis are upset after harassment and violence towards their group. Now, most recently, we learned about another event in Sweden. 18-year-old Rudolf Moilanen, was on his way home late at night. He was sitting alone in a bus station in Swedish Jordbro. several men arrived at the bus station who spoke English with each other. First they beat Rudolf unconscious. Then they poured fuel on his body, and lit it on fire. Then, they kicked his body down a hill. Miraculously, Rudolf has woken up, and is alive, but will be injured for life. In the hospital he could give details about the event. Just the other day, a Somali youth was arrested as a prime suspect in the crime. Rudolf believes the others were Arabs. 18-year old Rudolf was beaten unconscious and set on fire. Now, in the media, there has been an almost complete silence about Rudolf’s religion. There appeared a brief article here and there, but every effort seemed to be made to forget this case as soon as possible. Luckily, alternative media has kept the case alive and reported on its developments. I just recently learned that there now will be a demonstration for the Somalis, largely by Swedes. A manifestation against racism. But, say — who will demonstrate for Rudolf? We sympathise with Somalis who have been harassed. But why do we not sympathise with an 18-year-old Swede, whose life has been ruined, partly by a Somali? This is where Sweden is today. 0:08 was prevented from parking his car outside and abused in the street. 0:24 that all Somali families move away from this town. 0:28 ‘I really like this town, but presently we just can’t live here. 0:32 Not only me, all Somalis have a hard time here. 0:40 Adult Somalis go in groups of 2 when shopping. 0:44 In the town centre, only blond Swedish children play. 1:00 ... [?]. ‘Today, no children could go to school because we all are afraid. 1:20 of the group well and reacts strongly against what is happening. 1:52 police will look closer into it, and we will be back tomorrow. This is a trend in all Scandinavian media. Any incident of Arabs or blacks being victimized receives immediate attention by the national media. The much more frequent incidents of Danes, Norwegians, or Swedes being victimized by Arabs or blacks are either downplayed or ignored completely, and in any event the race of the attackers is often censored. This is actually similar to the situation in the US, where the Trayvon Martin story was immediately taken up by the national media, but numerous racist hate attacks by blacks on white that have happened before and after the Martin incident received only an article or two in local media. And just as in Scandinavia, American media frequently censors the race of the offender. I can see revenge in 18-year old Rudolf's eyes. I see his expression as determination. It takes determination to survive a thing like that. The "group" thats been "harasing" the somali's are a group of youths that have been active for a long time. They havent gone after the Somali's only but have acctually gone against basicly anyone. There is also no prof anywere that this gang is acctually swedish. Also, most of the Somali's that have moved out of that area have moved out becouse of other reasons. Swedish news dont bother getting their facts right aslong as they can blame it on sweds. They need say no more. One wonders if Rudolf's assailants will be charged with a hate crime? Moilainen is a Finnish surname, so Rudolf is either Sweden Finn or a Tornedalian, a member of both a linguistic and an ethnic minority in Sweden. and pray our Lord and Savior Jesus Christ will miraculously cure you and send the merciless culprits who did this very horrible thing to you to the eternal fires of hell. I have absolutely no sympathy whatsoever for the Somalians. How many have caused white flight from Swedish towns because of their behaviour? I wish someone would "deal" with the Somali problem on an estate near where I live where white folks are afraid to walk at ANY time of the day or night because of the fear of mugging by Somali-born refugees. Why shouldn't we see blonde children playing in the streets of Sweden. Aren't most Swedes born with mild variations of this complexion? When will we see the first journalist admit he could see he was a puppet on a string, but still kept doing the moves that the puppet-owner asked him to perform? Once that first one is dying, having nothing more to loose? I sympathise with you Scandinavians as the media bias, hypocrisy and selective censorship is exactly the same here in the UK. Unfortunately the same apathy amongst the general population is also in effect here. - "to keep a decent tone"
One of the commenters at Avpixlat encourages to take a look at Bernard Goldberg's "BIAS: A CBS Insider Exposes How the Media Distort the News". Another one, fears this non-free speech will trigger political violence. From the same discussion at Avpixlat, one commenter refers to a ”World Value Servey” where every five Swede between the age of 18 and 29 agrees to a Sweden being ruled by a strong leader, instead of democracy. In other words, rather dictatorship than democracy. "Should we laugh of cry?"